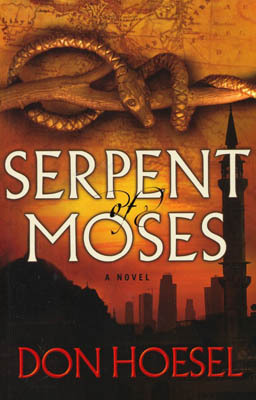 Serpent of Moses by Don Hoesel is a adventure novel about Jack Hawthorne who recovered part of Moses' staff (The Nehushtan), but he ends up getting captured in the process. His friends are looking for him and he is looking for a way out, but can he get out with the artifact or will he lose it to the others that want it? I have not come across enough Christian author's that can write a "Indiana Jonesesque" novel that is worthy of the genre. When I saw this book available, I did not know it was the second in a series, so I went out and bought the first (Elisha's Bones). I loved the first book. It was everything you could ask for in an adventure novel and the fact that they were pursuing a biblical artifact made it all the more appealing to me. The second book took much longer for me to get through, partly because I had less time to read it and partly because it was not as good as the first in the series. The writing in both books is great, the characters are as well. The reason why I found the second book to be much more exiting is because of the pursuit of the relic itself. The first book you are going through Jack Hawthorne's adventures exited to see how he is going to retrieve Elisha's Bones. In the second book, you are given a scene where he has found it immediately and the rest of the book becomes a pursuit of Jack himself. I found it took away from the mystery and anticipation in the book, the last chapter got interesting but it took me a long time to get there. If Don Hoesel continued in writing more Jack Hawthorne novels, I would be curious to see where he goes with it. Hopefully he can reclaim the adventure and mystery of the first novel. I would give the first book 4.5 out of 5 and the second a little less than 3.5 out of 5.